Pioneers in the industry, we offer d cut fancy saree cover bag, pvc saree cover bag, pvc zipper saree cover bag, saree bag, saree cover bags and saree cover box bag from India. Being a quality-oriented organization, we are engaged in offering a wide array of D Cut Fancy Saree Cover Bag to our clients. Ideal for gift and promotion purpose, offered Fancy Saree Cover Bag are available in numerous colors, designs and sizes to meet the different needs of our valued clients. Offered Fancy Saree Cover Bag are designed using premium grade fabric and progressive technology as per the set industry norms and standards. 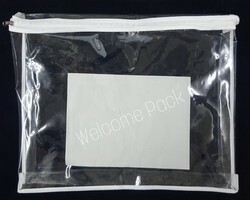 Saree Packing PVC Bag to pack sarees and garments in showrooms, in boutique shops, in wardrobes Saree Packing PVC Bag to pack sarees and garments in showrooms, in boutique shops, in wardrobes, during wedding functions and other such events. 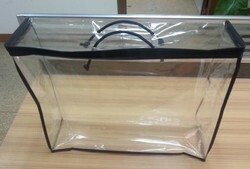 The bags ensure protection from moisture as well as dust. It improves the longevity of garments and keeps them as good as new. 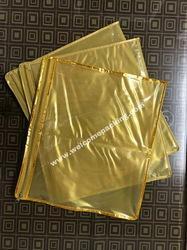 This is very useful in storing sarees dust free and well organized.This cover is Non Woven Material Border with Two Side Transparent Plastic and has a capacity of storing 1 heavy saree. 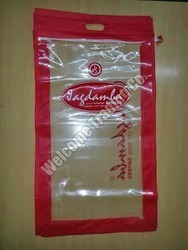 This is very useful in storing sarees dust free and well organized.This cover is Non Woven Material , Front side Plastic with Dcut Handle and has a capacity of storing 1 heavy saree. For the purpose of providing the finest PVC Bag to our clients, we engage in using the finest raw materials and modern machines in its manufacture. Owing to this, the offered product is known for superior strength, high durability, an impeccable finish and unmatched load bearing capacity. Further, for reasons of quality maintenance, the offered range is manufactured in accordance with the industry set norms and guidelines. 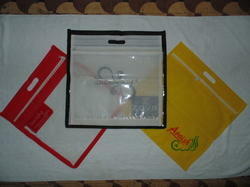 Being a notable enterprise of this industry, we are offering a wide range of Saree Cover Box Bag. Offered Simple Saree Set Cover Bag has the handle for its easy carrying option, zipper design to safeguard packed items from external damages like dust, moisture, light, and water. This Simple Saree Set Cover Bag is designed using high-grade material and contemporary machines in line with the set quality standards. Owing to the years of industrial experience, we have been able to serve our valued clients with a wide range of Fancy Saree Covers. These saree covers are especially designed with unique patterns to serve the choice of our valued clients in an effective manner. Our clients can avail these covers in different patterns, designs and sizes that suits best with their demands and requirements that too at feasible prices. Keeping in mind the ever-evolving needs of our clients, we are devoted towards offering an optimum quality array of Dcut Handle Saree Cover. 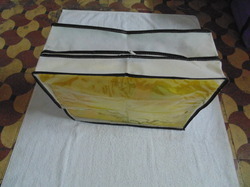 This saree cover is very useful in storing sarees, it is dust free and well organized. 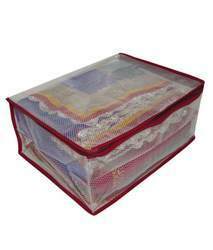 This cover is made by using Nonwoven material with Pvc Plastic and has a capacity of storing 1-2 heavy sarees each. 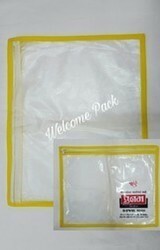 We offer our clients an optimum quality range of Multi Saree Packing PVC Cover Bag which is manufactured using the best grade PVC material and latest machines. 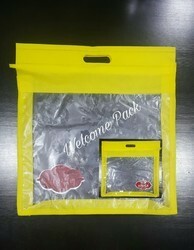 We provide this cover bag in various sizes as per the requirements of our valuable clients. Owing to its impeccable finish and tear resistance, this cover bag is widely acknowledged by our clients. Furthermore, to ensure the flawlessness, the provided cover bag is strictly tested by our quality experts on various quality parameters. This is combo packing bags.